My favourite plant is the nettle. 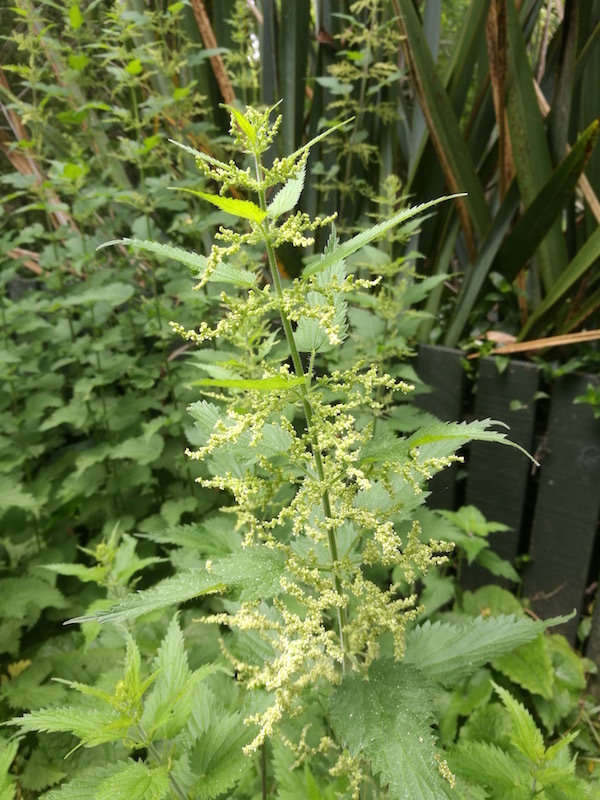 The European stinging nettle, Urtica dioica. There’s a nettle patch at the bottom of my garden. Nettles aren’t pretty or sculptural, unlike many other plants that are considered weeds. But they are interesting and very useful. Nettles have culinary, cultural, healing, ecological and gardening purposes. And much more. People sometimes ask me what nettles taste like. Nettle tea or infusion (see the recipe at the end of this post) tastes “green” to me. It’s sort of a mineral flavour. Some people have said it’s a bit “metallic”. Nettles contain a power-pack of minerals and other nutrients. Herbalists who work with energetics describe the taste of nettles as “salty”. Unlike many other herbs, nettles aren’t bitter. Nettles eaten as a green vegetable taste quite mild, a bit like spinach but better. 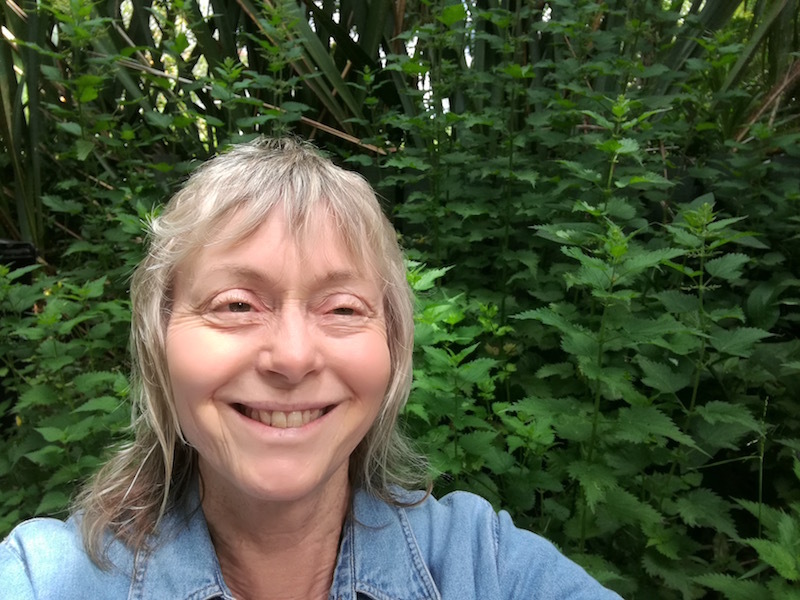 My plant originally came from Kay Baxter at Koanga Gardens, two decades ago, when they were based at Kaiwaka, north of Auckland. Above: me with my nettle plants. I keep them where they won’t take me by surprise. A lot of people hate nettles because of the sting. I agree that getting stung when you’re not expecting it is annoying and painful. That’s why I keep my nettles in an out of the way spot where they won’t take me by surprise. I don’t let them grow all over the place. If plant scientists ever decided to breed nettles for economic reasons (I don’t think they’ve ever bothered) the first thing they’d do is to get rid of the sting. But that is missing the point. A nettle without the sting wouldn’t be a nettle. Most people who deal with nettles wear heavy garden gloves, to avoid being stung. There are ways around this. Biodynamic farmer Peter Bacchus showed me how to handle a nettle plant carefully, so it didn’t sting me. But I don’t usually bother. You can apply the juice of a plantain leaf to neutralize a nettle sting. Dock also works, but plantain is better. Apart from the shock and discomfort, I think the impact of the sting of Urticaria dioica is a bit exaggerated. It doesn’t do lasting harm to your fingers. The buzzy feeling (it’s not exactly pain, just discomfort) goes away in about 24 hours. There’s no actual damage. You can’t get nettle parts embedded in your skin – unlike roses, blackberries etc. It’s not as uncomfortable or long-lasting as a bee sting. Herbalists say that nettle stings can be beneficial for some conditions. American herbalist Stephen Harrod Buhner has used nettle stings to help his arthritis. However, he says that he’s found that taking nettle internally as infusion or nettle beer is also effective for this. Above: this is what nettle flowers look like. Not very high-profile. The old saying “grasp the nettle” means to tackle something that’s difficult boldly. There’s something subversive and mischievous about growing nettles, rather like nettles themselves. They’re persistent and energetic and unapologetic. Nettles are a common weed in Europe, part of the ecology, but in New Zealand they’re considered a pest. Nettles are even illegal in some parts of this country, in particular Otago. New Zealand local authorities are prone to banning plants, including many useful medicinal herbs. There are a lot of illegal plants in New Zealand! That’s because the New Zealand environment is inundated with animals and plants from all over the world, running riot over our native flora and fauna. I haven’t encountered European nettles growing wild in New Zealand, although people have told me that nettles are a problem in some country areas. Enough of a nuisance to get banned. But some of my New Zealand friends had never heard of nettles until I showed them my plants. A small nettle plant. Looks pretty innocent but it has a bit of a bite. New Zealand has a native nettle species, and it’s a strong contender for the title of scariest plant. Urtica ferox, the tree nettle, ongaonga, is a large woody shrub, up to 5m tall, that grows in temperate bush in both the North and South Islands. The sting is much more aggressive than European nettles – even the lightest touch can result in a painful sting that lasts several days. There’s been one reported human death from Urtica ferox stings. I’ve never encountered Urtica ferox. There’s no way anyone could mistake it for my beloved Urtica dioica. 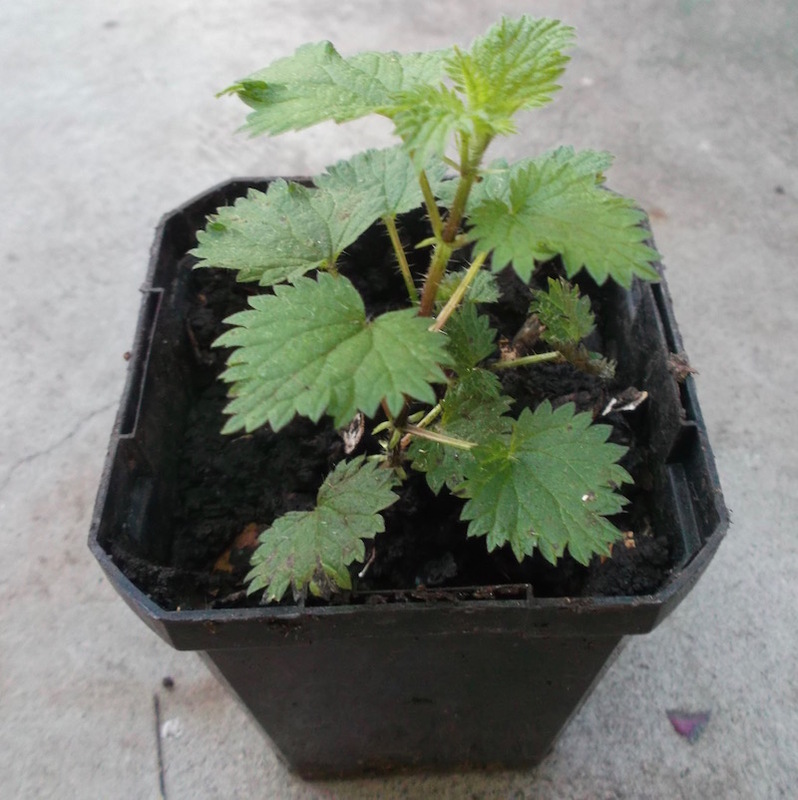 Nettles are easy to propagate with root cuttings. They can also be grown from seed. They grow vigorously for most of the year, especially in spring. I feed my nettle plants with compost tea and/or comfrey and seaweed fertilizer occasionally. I’d recommend growing nettles in a big plastic tub of compost, and keeping watch on them so they don’t escape into the garden at large. At some point in summer my nettles become full of Red Admiral butterfly caterpillars. These are New Zealand natives, and they prefer Urtica ferox, but they also like European nettles. They nibble down the leaves and turn into chrysalises. Then I have to let the plants alone for a while, until the butterflies hatch and the leaves grow back. My family and friends tolerate my nettles, along with my other eccentricities. The only other person in the family who appreciates nettles is my niece Eva. She recently asked me for some plants to grow in boxes at her new home in West Auckland. Nettles are full of a wide range of minerals and other nutrients. In past centuries they were a nutritious food for country people. Nettles are important in traditional herbalism. And nettle fibre was used to make fishing nets, cloth and paper. Nettles are also very useful in organic gardening and organic farming in general. They are a great compost activator and make nutritious liquid fertilizer. 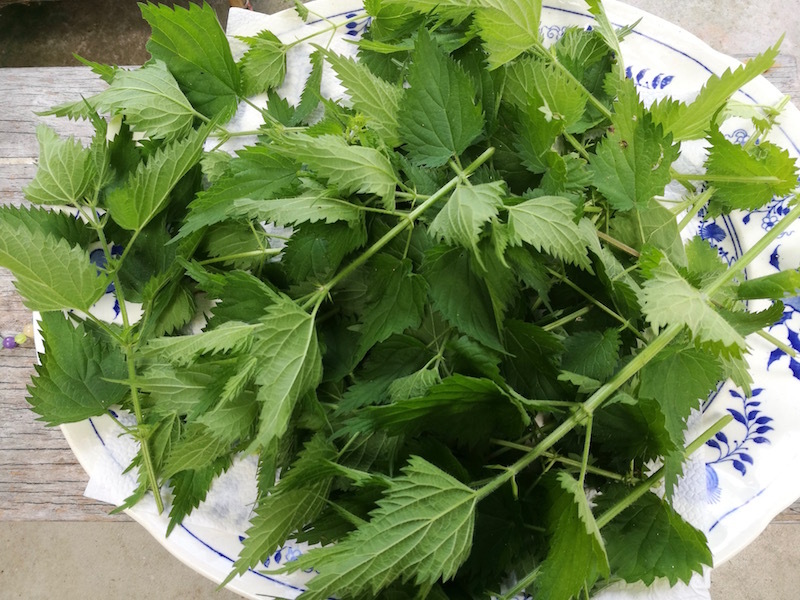 Freshly picked nettles dry quickly on a flat tray or basket. Nettles are a valuable herb for traditional European herbalists. All parts of the plant are used, including the root, seeds and leaves. They’re used for a wide variety of health conditions. Ethnobotanist James Wong says nettles can be particularly helpful for hay fever. American herbalist Susun Weed recommends drinking nettle infusion, as an effective way to get the benefits of nettles. The suggested amount is no more than one to two cups of infusion daily. I’ve never had any side effects from this quantity. It’s not a quick-fix remedy. The positive effects will gradually and gently happen over several weeks. However, I have heard of people overdosing on nettles. Nettles are powerful medicine. More is not necessarily better. If you have a serious health condition I’d strongly suggest starting with a smaller quantity. I’d also recommend taking the advice of an experienced herbalist rather than self-dosing. Nettle infusion contains more nutrients when made from dried leaves. Place in a one litre jar. Cover and leave for four hours. Strain off the liquid and store in the fridge. You can re-use the nettles once. The second brew won’t taste as strong as the first, but it still has plenty of nutrients. Put the used nettles on the compost heap or in the worm bin. Pick leafy stalks of nettles in the morning on a dry sunny day. Spread the nettles on a big flat tray or basket. I line the tray with paper towels. Cover loosely with paper towels. Leave in an airy place, not in direct sunlight. Turn the nettles over every few hours if you remember. Once a day is okay. The nettles will gradually dry out over a few days. Chop the dry stalks roughly with kitchen scissors. Store in a paper bag in a dry place. Other versions of nettle beer include ginger and various herbs, e.g. dandelions and cleavers. The flavour is quite unique. It’s a great non-alcoholic (okay, very low-alcoholic) drink to take to family Christmas, to tease people and challenge their tastebuds! Place sugar, lemon peel (no white part), lemon juice and cream of tartar in a large crock or bucket. Cook nettles in water for 15 minutes. Strain into the crock or bucket and stir well. When this cools to blood temperature, dissolve the yeast in a little water and add to the crock. Cover with cloth and let brew for three days. Strain out sediment and bottle. This gets fizzy, so use bottles that can handle fizz. Ready to drink in eight days. Nettles make an interesting cooked vegetable – rather like spinach, but better tasting and more nutritious. Steam or stir-fry fresh nettle tips, as you would cook spinach. The recipe for this spring delicacy comes out of Cuisine Bon Marche, by Hugh Fearnley-Whittingstall, one of my favourite books. If you don’t have fresh tarragon, use chives instead. Pick over the nettle tops, removing damaged/ dead leaves and bugs etc. Rinse the leaves well and shake dry. Melt butter in a large saucepan. Add garlic and onion and cook gently until onion is soft and lightly browned. Pile the nettle leaves into the saucepan. Pour in the hot stock and return to the boil. Allow to simmer for 3 – 4 minutes. Ladle soup into a blender, pureeing until smooth, in batches if necessary. Return soup to a clean plan. Strip the leaves off the tarragon stalks, chop them – not too finely – and stir two-thirds into the soup. Season to taste with salt and pepper. Reheat the soup without reboiling. Lightly whip the cream, and stir two-thirds into the soup. Serve the soup with a small blob of the remaining cream and a pinch of chopped tarragon in each bowl. This delicious tonic comes from Grow Your Own Drugs, by James Wong. Place rinsed, chopped nettles in a 1 litre glass jar. Peel the zest from the oranges and add to the jar. Pour red wine over the top. Cover the jar and leave for two weeks.